The progress by volunteers and Citizens United to preserve the Greensville County Training School is showing positive. The Emporia City Council had marked the structure to be taken down nearly four years ago before a new plan was introduced to save the historical site. 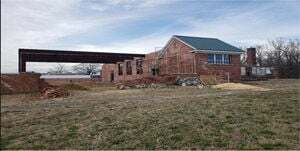 In November of 2015, Marva Dunn successfully negotiated an agreement with the Emporia, City Council to delay the decision previously made for demolition of the Greensville County Training School (GCTS). Dunn describes herself as not being a begger unless it is for a good cause or to help someone else and it must be after she has exhausted all other avenues of getting the task done. However, that night in November she was willing to beg. She was doing this in memory of her mother, Mrs. Della Moore Richardson. Her mother, who lived to be 102, attended the historic Rosenwald School. Years later, Dunn remembers vividly hearing these words “I sure hope they can save the Training School, when I get my little check, I send them a little money”. In November of 2015, when Dunn read an article in the Independent-Messenger that the City Council had voted to demolish what remained of the GCTS, all she could hear was her mother’s voice saying “I sure hope they can save the Training School” That voice is what lead her to the city council meeting that night. The council voted to give Dunn an opportunity to meet with the Citizens United to Preserve the Greensville County Training School to get permission to recruit a Special Project Committee. The task of this committee would be to develop a feasible plan of actions that would delay or change the city council’s decision for demolition. Dunn formed the committee and contacted Storefront Design Middle of Broad (mOb) team in Richmond. Storefront Design is a non profit organization that partners with Virginia Commonwealth University to work with historical preservation projects. The agency did not work outside of the Richmond area. However, after hearing Dunn’s story the group agreed to help the committee with the project. Using her vivid imagination Dunn described an image of what she would like to see at the site. The architect from the mOb team drew a concept design that was presented to Emporia City Council and the work to save the GCTS began. “It has been a struggle, a lot of long hours, some all-night long hours of work, but the fruits of our labor can finally be seen, and “We will continue to march on until victory is won.” says Dunn.